Just before you’re getting ready to head overseas, you suddenly remember: Europe has different electrical wall outlets. And Australia has even stranger ones. Which one do you need? You don’t want to blow out your smartphone or ruin your camera’s battery charging dock. Different countries have differently shaped electrical wall outlets. 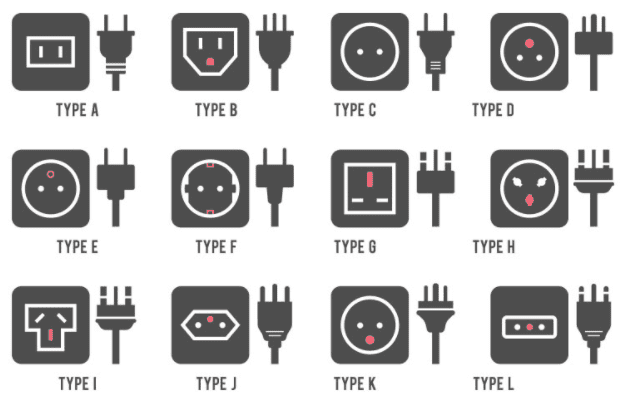 In fact, there are 15 varying kinds of plugs. Here’s a full visual breakdown of each plug and which country it belongs to. 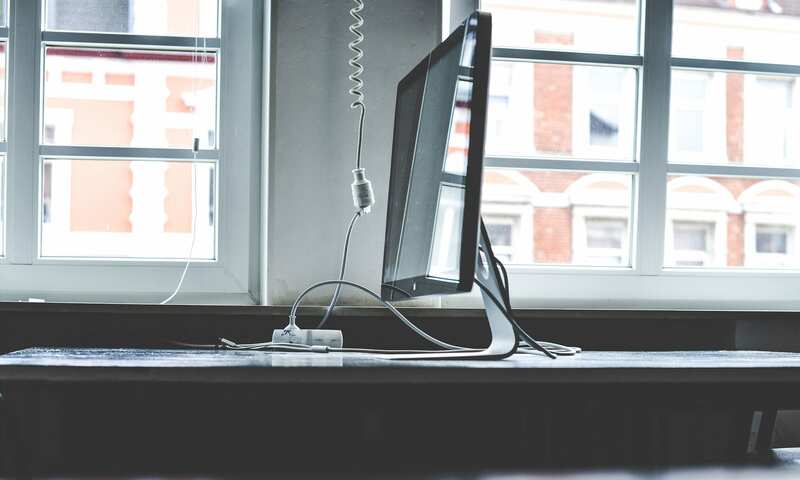 Countries also have a range of electrical voltage running through their wires. In the United States, electricity runs on 110-120 volts. Much of the rest of the world runs on 220-240 volts. In other words, your chances of frying your laptop’s battery by exposing it to a higher voltage when traveling, are higher. Enter a power converter. Which you’ll need if your device isn’t dual-voltage or multi-voltage. More on that voltage down below. Otherwise, prepare for sparks and the stink of a fried motherboard. How Do I Know if I Need a Power Converter? Check your device’s voltage listing. On my laptop, this voltage is found on the thick AC box on my laptop’s power cord. Look for input. Electrical devices have three different types of voltage: single, dual, or multi. 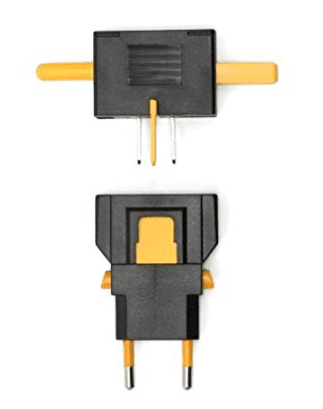 Single voltage reads one number — this device handles one type of voltage like 120V. Dual voltage reads two numbers like 110V/220V –there is a switch to toggle between the two voltages. Multi-voltage reads 100-240V — most common on battery chargers and AC transformers for laptops, tablets, other portable devices. 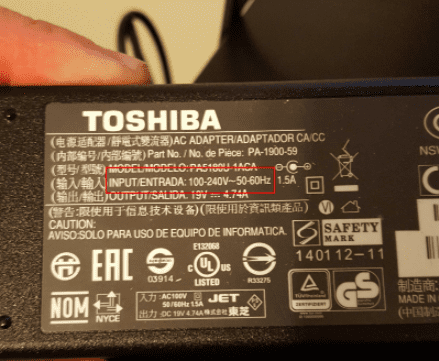 In this example, my Toshiba laptop is a multi-voltage with a range of 100-240V. Meaning I won’t need a power converter to use my laptop overseas. Just a travel adapter to plug my laptop into the wall socket. Feeling a tightness in your chest that signals overwhelm? Take a deep breath. Not to worry. Let’s break it down. 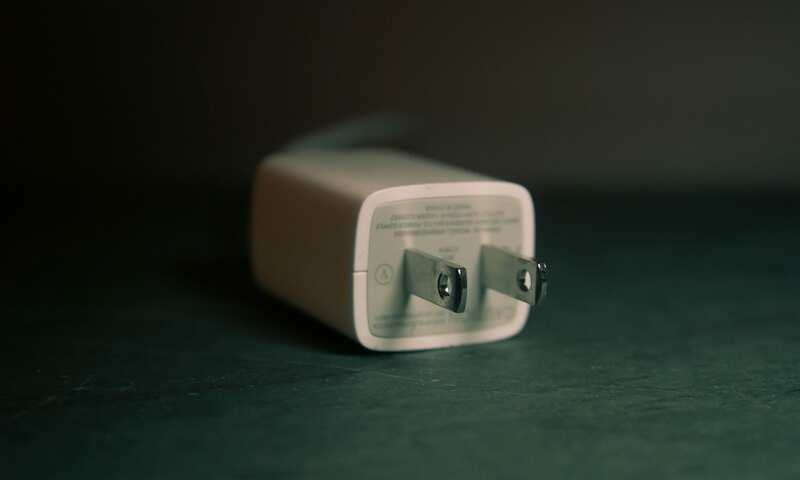 For the quick answer to your question: “I’m traveling to China, what adapter do I need?” Check out this exhaustive list of countries and their voltage and prong type. Otherwise, hang with me. There’s a simpler way of traveling with a power adapter without needing to buy 15 kinds of prongs. Most of the countries you’ll be traveling to fall into one of 4 outlet types for US, UK, Australia, and Europe. Okay, we’re about to get a little technical. Watts are the baby that amps (measure the flow of electricity as a current) and volts (amount of force each electron is under, like water in a hose) make when they combine. Watts are a measurement of how much energy is being released. In other words, watts indicate how quickly you can overheat and melt your electrical device. When you’re looking for a travel adapter, you’ll need to know how many watts (W) it can handle. Make sure your travel adapter can handle the flow of energy passing through it. If you’re using a hair dryer or coffee maker, they use a high wattage setting of 1000-2000W. So your chances of blowing a fuse or scorching your adapter are much, much higher. Just use the hair dryer at your destination instead of packing one. Lifehacker’s readers rated this small travel adapter as great for devices that have variable voltage (i.e. 110-240V). Amazon’s picky reviewers backup Lifehacker’s choice. This travel adapter rates 4 out of 5 stars, based on 162 reviews. 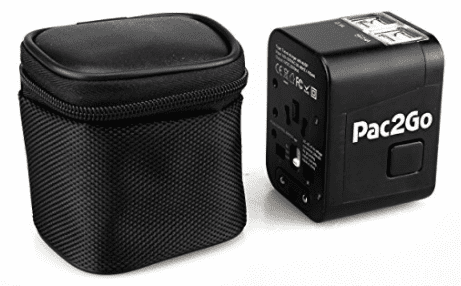 This travel adapter will work in more than 150 countries. And it “folds flatter than any other adapter on the market,” according to its Amazon item description. Sounds perfect to me. One little box with a surge protector to keep your devices charged and ready for use. Lifehacker’s readers rated this as the best travel adapter. 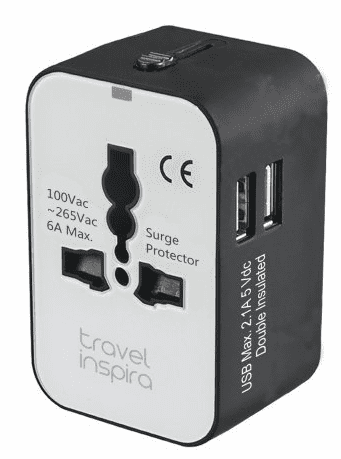 This travel adapter has dual USB charging ports for your smartphone, portable power bank, or other USB-powered devices. Use it in the 4 zones (Australia, UK, Europe, US) and easily switch prongs in and out as needed. Note: it doesn’t do voltage conversion. It’s a straight-up wall-plug adapter. This travel adapter has prongs for the US, UK, Europe, Australia, and China. The handy device can handle 830 watts of power (at 110 VAC) or 1750 watts (at 230 VAC). This 2.5 inch cube has integrated plugs (translation: no loose parts to possibly wander off) for US, Europe, Australia, and UK. Simultaneously charge up to five devices at once with the USB ports and electrical socket. In addition, you get a spare fuse for when you miscalculate wattage and blow it out. Oh, and you get an 18-month guarantee. 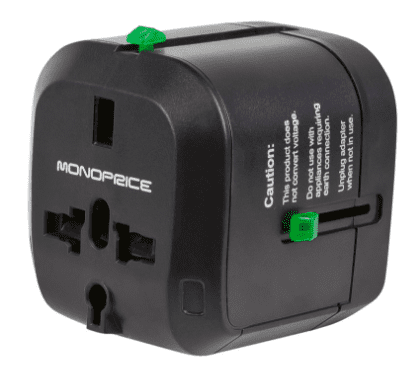 “Lightweight… Also, if you’re traveling with a non-US companion, they can plug their AC devices into the universal socket, too.” The Points Guy rated this travel adapter a solid A. 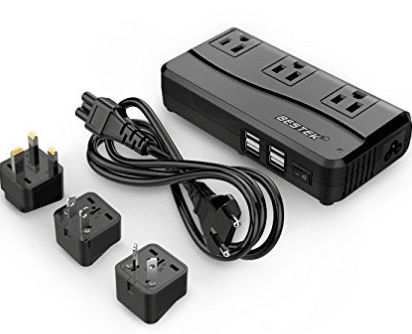 Need to charge 4 USB devices and 3 wall-outlet devices? At once? No problem! This all-in-one adapter will charge all 7 of your devices. Just beware the combined wattage is less than 200x, so you don’t overheat the poor adapter. This adapter and converter also converts voltage from all countries into the US voltage (110V). My favorite part is the 5-foot power cable, so you can set up your power charging station anywhere. 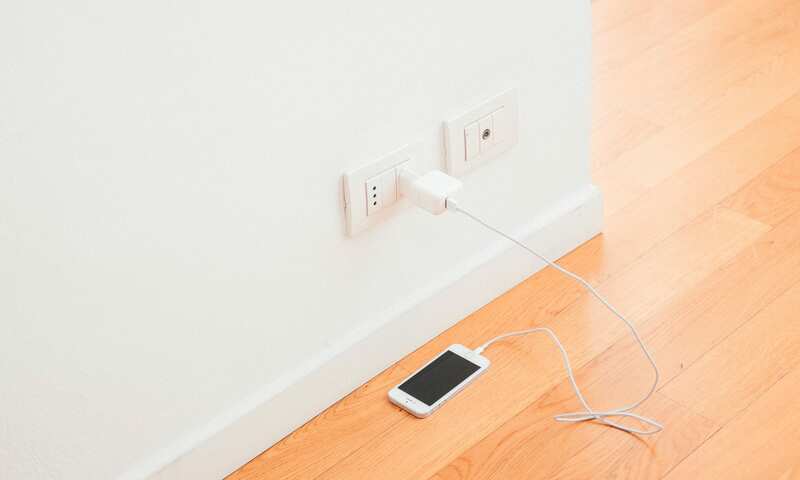 Yup, even if the wall outlet is in a super awkward spot like behind the desk in your room. Thanks to over 2500+ reviews on Amazon, this nifty travel adapter has 4 out of 5 stars. It also comes with a 24-month guarantee. The Points Guy found this device a bit overkill for a solo business trip. 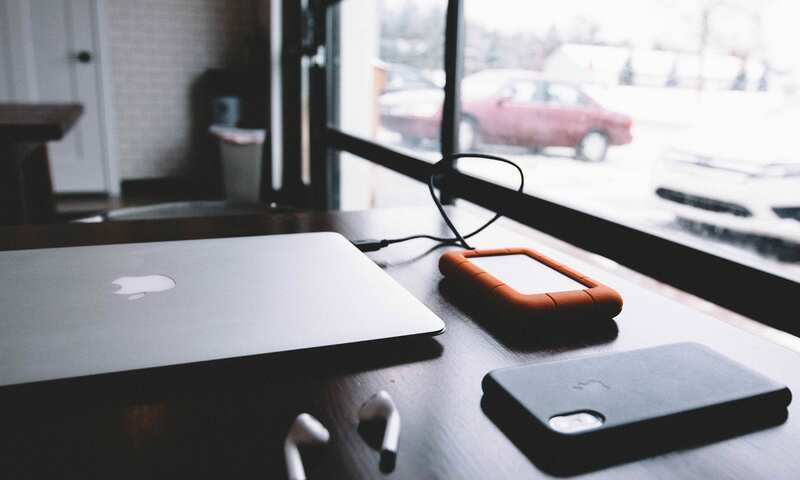 But if you’re traveling with someone else (who also has a laptop, smartphone and/or camera battery to charge) or a family with their own personal suite of devices, this travel adapter is a great one to tuck into your travel backpack. Traveling overseas requires a travel adapter, so you can convert the wall outlet to different combos of plugs. If you need to convert voltage for a single or dual voltage device, you’ll need a power converter.